Learning Kotlin by building Android Applications: Explore the fundamentals of Android development with Kotlin by building amazing and effective Android applications. Develop amazing applications that will help you understand and explore the fundamentals of Kotlin while covering 3 various types of projectsKey FeaturesExplore the fundamentals of Kotlin by enabling you to build effective Android applications.Develop and test Android applications using only the Kotlin language.One of the major as well as best features of Android Kotlin is its deep interoperability with Java.Book DescriptionGoogle has shifted the curve by extending support to the widely adopted powerful programming language, Kotlin. It works parallel with Java and C++, which makes it easier even for existing developers to learn a new language altogether for their most favored platform.This book has a project styled approach where we focus on teaching Android development by building 3 different Android Applications.The book will begin by giving you a strong grasp of the Kotlin language and it's APIs to further take steps towards building stunning applications for Android. It will show you the environment setup as the difficulty level grows steadily with the coming applications covered in the upcoming chapters.The book will also introduce you to the Android Studio IDE which plays an integral role in Kotlin Android Development. It will cover Kotlin's basic programming concepts such as functions, lambdas, properties, object-oriented code, safety aspects and type parameterization, testing, concurrency which will guide you to write Kotlin's code to production.Lastly our reader will be taken through the process of releasing their app on the Google Play Store. They will also be introduced to other app distribution channels such as the Amazon and Appstore.As a bonus chapter, the readers will also learn how to use the Google Faces API to detect faces and add fun functionalities.What you will learnLearn the basics of using the Android Studio IDE and a number of basic programming concepts in KotlinDiscover Android development by building Android apps with KotlinUncover some amazing features of Kotlin that gives it an upper hand over JavaKotlin Interoperability with JavaIntegrate Crashlytics for crash reporting and beta testing.Automate your build process with continuous integration tools.Learn to release and publish your app in various distribution channels.Who This Book Is ForIf you are completely new to any one of Kotlin, or Android platform, and are aiming at publishing Android applications for fun or for a business purpose, but you have no clue as to where to start, then this book is for you. 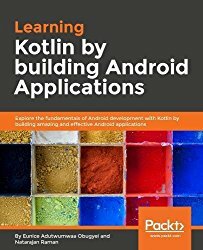 This book is also for advanced Android developers who want to learn to use Kotlin instead of/alongside Java for Android development.